If you’re considering a software or hardware purchase, but just haven’t been able to pull the trigger – ask your tax advisor about Section 179 and the benefits of making purchases before December 31, 2018. Or, contact Net at Work about any potential technology-related purchases & we can connect you with the appropriate tax and leasing advisors. Section 179 of the IRS tax code allows businesses to deduct the full purchase price of qualifying equipment (which includes software, hardware) purchased, leased or financed during the tax year. For all the qualifying equipment you buy or lease, you get to deduct the full purchase price from your gross income. 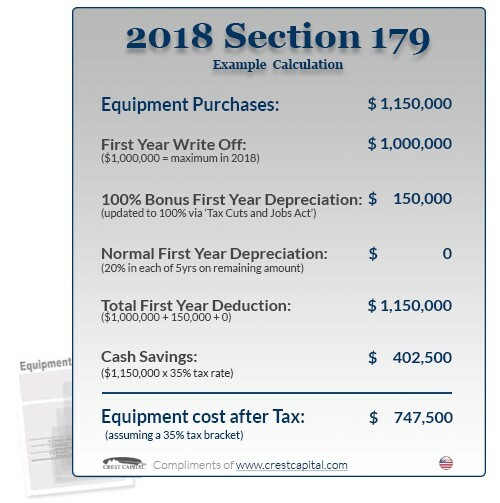 If you elect to take Section 179, the full price of your equipment will be taken up front and not written off over time, like most practices do for their equipment. For complete details visit: www.Section179.org. 2018 Deduction Limit Raised to $1 Million! This year, the deduction limit has been raised to 1 Million Dollars. This is a substantial deduction and means businesses can deduct the full cost of equipment from their 2018 taxes, up to $1,000,000. This can really make a difference to your bottom line at the end of the year. To be eligible purchases be made by & put into service by midnight 12/31/2018. Use Form 4562 to claim your deduction. The main benefit of a non-tax capital lease is that you can still take full advantage of the Section 179 Deduction – yet make smaller payments. With a non-tax capital lease, you can acquire and write-off up to the deduction limit worth of equipment this year, without actually spending that amount this year. Use the Calculator and Find Out! Try It Now. Act soon, buy your business equipment & software before December 31 to capitalize on tax savings!